As the King of Iolcus, Jason had everything—a prosperous kingdom, the respect of his peers, and a beautiful fiancé. When she was killed on their wedding day, he vowed to do anything to restore her life. Now, in order to accomplish this heroic feat Jason must seek out the Golden Fleece -- and with the help of Greek mythology's greatest heroes -- set sail on the most epic voyage of all. 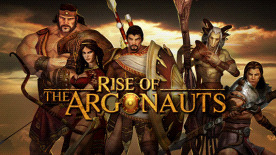 A grand scale Action/RPG, Rise of the Argonauts™ immerses players in a gladiatorial adventure set in the vibrant and powerful world of Ancient Greece brought to life. Taking the role of Jason, players will battle alongside Hercules, Achilles and other Argonauts as they engage in brutal combat against formidable beasts and enemies, in a vast world alive with wondrous inhabitants and stunning panoramas. The search for the Golden Fleece is not only one of exploration but of transformation -- from warrior king to exalted hero touched by the gods. Immerse yourself in gameplay through a redefined RPG experience that streamlines character and resource management. Spend more time playing and less time micro-managing inventory and resources through a streamlined HUD and inventory system. Unleash devastating attacks in real time with lethal combinations of weapons, powers granted by the gods and the battle tested loyalty of your Argonauts. Assemble the most effective team of Argonauts for each mission to put the best battle plan forward. Explore the vibrant and powerful world of ancient mythological Greece brought to life. Experience a living, breathing and vivid ancient world taking you far beyond the broken statues and ruins that so often define the myth.